How many types of harmonicas are there? The harmonica, also known as a French harp or mouth organ, is a free reed wind instrument used worldwide in many musical genres, notably in blues, American folk music, classical music, jazz, country, and rock and roll. There are many types of harmonica, including diatonic, chromatic, tremolo, octave, orchestral, and bass versions. A harmonica is played by using the mouth (lips and tongue) to direct air into or out of one or more holes along a mouthpiece. Behind each hole is a chamber containing at least one reed. A harmonica reed is a flat elongated spring typically made of brass, stainless steel, or bronze, which is secured at one end over a slot that serves as an airway. When the free end is made to vibrate by the player’s air, it alternately blocks and unblocks the airway to produce sound. Have many people asked me: How many types of harmonicas are there? Today, i will intro you about each of harmonica types. 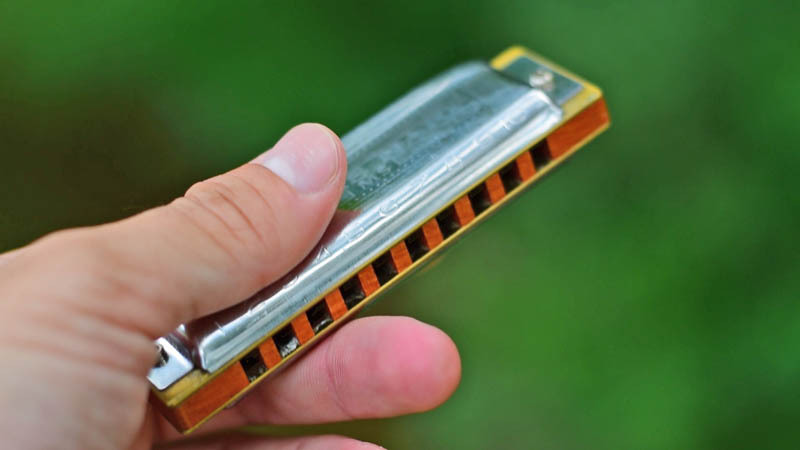 The chromatic harmonica uses a button-activated sliding bar to redirect air from the hole in the mouthpiece to the selected reed-plate, though one design—the “Machino-Tone”—controlled airflow by means of a lever-operated flap on the rear of the instrument. Also, a “hands-free” modification to the Hohner 270 (12-hole) lets the player shift the tones by moving the mouthpiece up and down with the lips, leaving the hands free to play another instrument. While the Richter-tuned 10-hole chromatic is intended to play in only one key, the 12-, 14-, and 16-hole models (which are tuned to equal temperament) allow the musician to play in any key desired with only one harmonica. This harp can be used for any style, including Celtic, classical, jazz, or blues (commonly in third position). Strictly speaking, diatonic denotes any harmonica designed to play in a single key—though the standard Richter-tuned harmonica diatonic can play other keys by forcing its reeds to play tones that are not part of its basic scale. Depending on the country, “diatonic harmonica” may mean either the tremolo harmonica (in East Asia) or blues harp (In Europe and North America). Other diatonic harmonicas include octave harmonicas. There are eight kinds of orchestral melody harmonica; the most common are the horn harmonicas often found in East Asia. These consist of a single large comb with blow-only reed-plates on the top and bottom. Each reed sits inside a single cell in the comb. One version mimics the layout of a piano or mallet instrument, with the natural notes of a C diatonic scale in the lower reed plate and the sharps and flats in the upper reed plate in groups of two and three holes with gaps in between like the black keys of a piano. Another version has one “sharp” reed directly above its “natural” on the lower plate, with the same number of reeds on both plates (therefore including E♯ and B♯). Horn harmonicas are available in several pitch ranges, with the lowest pitched starting two octaves below middle C and the highest beginning on middle C itself; they usually cover a two- or three-octave range. They are chromatic instruments and are usually played in an East Asian harmonica orchestra instead of the “push-button” chromatic harmonica that is more common in the European and American tradition. Their reeds are often larger, and the enclosing “horn” gives them a different timbre, so that they often function in place of a brass section. In the past, they were referred to as horn harmonicas. The other type of orchestral melodic harmonica is the polyphonia, (though some are marked “chromatica”). These have all twelve chromatic notes laid out on the same row. In most cases, they have both blow and draw of the same tone, though the No. 7 is blow only, and the No. 261, also blow only, has two reeds per hole, tuned an octave apart (all these designations refer to products of M. Hohner). The chord harmonica has up to 48 chords: major, seventh, minor, augmented and diminished for ensemble playing. It is laid out in four-note clusters, each sounding a different chord on inhaling or exhaling. Typically each hole has two reeds for each note, tuned to one octave of each other. However, less expensive models often have only one reed per note. Quite a few orchestra harmonicas are also designed to serve as both bass and chord harmonica, with bass notes next to chord groupings. There are also other chord harmonicas, such as the Chordomonica (which operates similar to a chromatic harmonica), and the junior chord harmonicas (which typically provide six chords). The Suzuki SSCH-56 Compact Chord harmonica is a 48-chord harmonica built in a 14-hole chromatic harmonica enclosure. The first three holes play a major chord on blow and draw, with and without the slide. Holes 2, 3, and 4 play a diminished chord; holes 3, 4, and 5 play a minor chord; and holes 4, 5, and 6 play an augmented, for a total of sixteen chords. This pattern is repeated starting on hole 5, a whole step higher; and again starting on hole 9, for a total of 48 chords. The ChengGong harmonica has a main body, and a sliding mouthpiece. The body is a 24-hole diatonic harmonica that ranges from B2 to D6 (covering 3 octaves). Its 11-hole mouthpiece can slide along the front of the harmonica, which gives numerous chord choices and voicings (seven triads, three 6th chords, seven 7th chords, and seven 9th chords, for a total of 24 chords). As well, it is capable of playing single-note melodies and double stops over a range of three diatonic octaves. Unlike conventional harmonicas, blowing and drawing produce the same notes because its tuning is closer to the note layout of a typical Asian tremolo harmonica or the Polyphonias. The pitch pipe is a simple specialty harmonica that provides a reference pitch to singers and other instruments. The only difference between some early pitch-pipes and harmonicas is the name of the instrument, which reflected the maker’s target audience. Chromatic pitch pipes, which are used by singers and choirs, give a full chromatic (12-note) octave. Pitch pipes are also sold for string players, such as violinists and guitarists; these pitch pipes usually provide the notes corresponding to the open strings.